A collection of paintings by Bujinkan Dojo Head Instructor, Masaaki Hatsumi. Students travel from all over the world to train with Hatsumi Sensei at his Bujinkan Dojo in Noda City, Chiba Prefecture, Japan. Hatsumi Sensei is the head instructor of nine traditional martial schools and he represents a martial history which extends back 1,000 years. About 30 years ago, Hatsumi Sensei made a series of colorful paintings to help instruct his students in the traditions of his dojo. Viewing Sensei's paintings is a way of connecting with the deep martial traditions he teaches. This book is the first in a series to document those paintings. The book includes essays by the artist and the publisher and an appendix which provides background information for the paintings. Action photos shot at the dojo show the close connection between the paintings and the artist‘s physical training. The book is in Japanese with English translations. Swiss binding allows the front cover to open completely so a special signature page lays perfectly. The exposed thread-sewn book block lets the book open as fully and as flat as possible so the Sensei's art and the photos can be viewed clearly. There is also a traditional Japanese book box to beautifully hold the book. 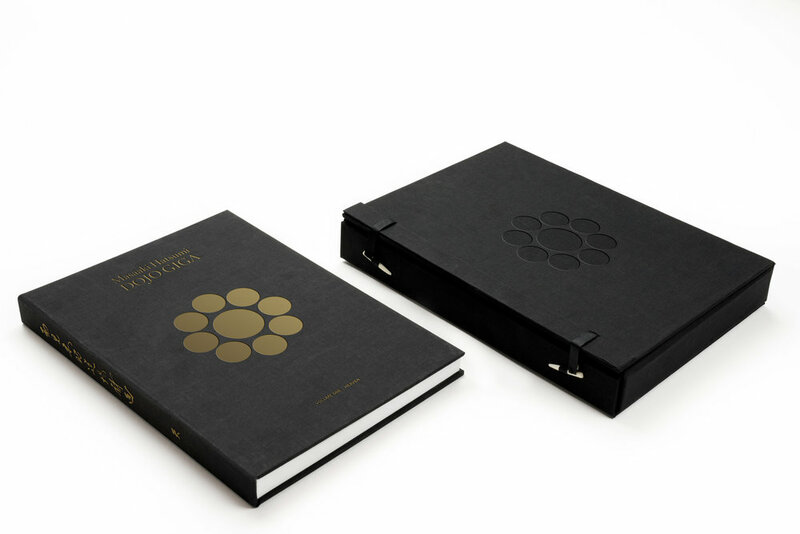 Standard edition comes with a blank Japanese Washi signature page on the inside front cover. The Collector signature page incorporates a hand-made sheet of washi which is hand-stamped and numbered. The Collector edition washi is thicker and suited to suibokuga paintings. The paper is provided by a washi maker recognized by UNESCO for their traditional Japanese paper making methods. For his students, the artist can paint right on this washi paper to sign the book. Detail of hand-stamped artist signature and edition number. The Collector Edition comes with a traditional Japanese book box with a blind emboss to match the cover of the book. Japanese book box in action. The first book on Masaaki Hatsumi's artwork. Do you love beautifully designed books on art and culture? Sign up for our newsletter and get first access to newly released titles and receive exclusive offers for limited editions and other great products you can’t get anywhere else.